Hi everyone! Somehow it’s Saturday again, so that means it’s time for another installment of My Week Unwrapped! It’s been a busy week for me, but again som of the games I’m playing are pre-release, so I can’t discuss them all yet. But there’s still plenty to talk about! First off, I had Untame’s fantastic Mushroom 11 a couple of weeks early and even though it was really hard for me at times, I was determined to finish it. I wasn’t sure I’d be able to, but I did and it was so worth it! In case you don’t know, the game was first released on PC, but it feels so much more natural to me on my iPhone. It’s one of those games that was just born for a touch screen. The way it works is you use your finger to erase part of this green blob and the cells you erased grow back somewhere else on it. So to move it forward, you have to erase the cells from behind and not give them room to grow back there. It sounds weirder on paper than in practice. Once you start messing around with it, it just feels natural. And the game forces you to learn how to use it in new ways not by telling you, but by throwing puzzle after puzzle at you to solve. It’s not without its frustrations, and I’m sure some players will unfortunately give up on it before reaching the end. But if you do stick with it, it will not stop surprising you. You can read my full review here and watch some videos I made below. I spent more time with Wadjet Eye Games’ point-and-click adventure Shardlight and made some good progress. This time the game is available on iOS for everyone, so I can talk more about it. I am interested in seeing where the story goes, so I will likely finish it. And the puzzles so far have been fairly straightforward. But the dialogue often feels a bit stiff and forced and there’s just so much of it that doesn’t feel necessary. I don’t want to skip it and miss the story, but there isn’t anything about the dialogue that hooks me and pulls me in, making me want to sit through it all. So I wouldn’t say it’s a bad game, but it just hasn’t been pulling me back when I have about ten other games I’m in middle of at any given moment. But if you’re curious and have a bit more patience than I do, check it out. You can also try my video walkthrough, with the latest one embedded below. Alec Thomson, the brain behind Swap Sword, released another match-three puzzler today called Beglitched, this time together with Jenny Jiao Hsia. I’d been looking forward to it ever since it released on PC and I heard it was going to be ported to iOS. I haven’t gotten that deep into it yet, but what I’ve played I really like so far. It has you playing as a glitch witch, hacking files and battling all sorts of animals on a match-three board. It’s fully premium, no in-app purchases or any of that nonsense that’s so common in these games. It also mixes things up a bit in that you have to use compasses to narrow down the location of the animal you’re battling, then try to explode a bomb in that area and expose him. If you use up too many turns and don’t replenish them, you’ll lose lives and can lose that whole level when you run out. The games is broken into several sections, and you have to pass one to unlock another. But you start the next one without any of the money or items you earned previously. Well, that’s how it is for now, at least. The game implied that might change soon. I’m still fairly early on, so I expect lots of surprises. The match-three sections are broken up with some Minesweeper-like bits, and I’m finally starting to get the hang of those too. There’s a lot going on here, secrets to uncover, all sorts of fun stuff. It’s a bit discouraging when I’ve made good progress in a level, then die and have to start over. But I plan to stick with it and hopefully beat it. I’m also hoping there might be some endless mode once you beat the story mode. Alike Studios’s wordless point-and-click adventure, Love You to Bits, is this week’s Free App of the Week on the App Store, and since I didn’t play it when it release, I grabbed it. So far I’ve been enjoying it, though there are some frustrating moments later on, especially when it comes to finding the bonus items in some levels. I also wish my character walked faster and that I could mute the music without the sounds, as it’s super repetitive and makes me anxious. I’m also stuck at the moment, not sure if I’ve hit a bug. But the first ten or so levels were really enjoyable and I do recommend picking it up, especially since it’s free at the moment. If I can get past the point where I’m stuck, I hope to finish the current content since the ending is planned for later this month. If you need any help, I have a walkthrough for the first fifteen levels, including all bonus items. 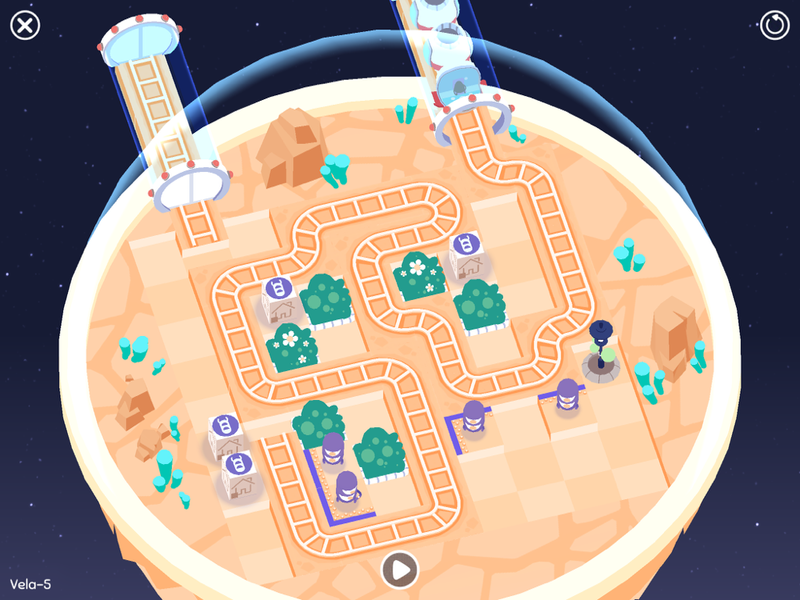 And last, I can’t show video yet but I’ve been playing Draknek’s upcoming puzzler Cosmic Express. It was, appropriately, first thought up during a train jam and then built upon into a full-blown game with charming graphics that are easy on the eyes. The developer, Alan Hazelden, is the brain behind the genius and adorable A Good Snowman is Hard to Build, so I’d been looking forward to this one. Once again, he delivers with super tough yet user-friendly relaxed puzzles. You basically draw train tracks around the board to first pick up aliens and then drop them near the corresponding boxes, which apparently turn into instant alien houses. 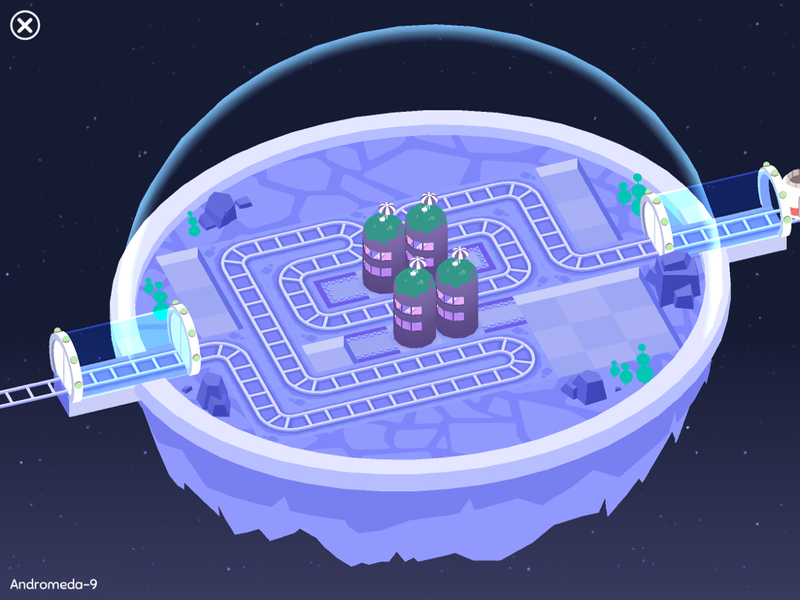 You need to get all aliens into a home in order to pass the level. Each constellation worth of levels adds something new to the mix. There’s also iCloud, which is welcome because it plays fine on an iPhone but I choose my bigger iPad when I can. It makes it easier to draw the tracks without mistakes. And that is probably my only real complaint about the game — the track drawing can be fiddly at times. It’s pretty forgivable, though, due to the laid-back nature of the game. And it wins huge points from me for having the option to unlock all levels from the start — no strings attached! I’m still working my way through the game, as it’s both tough and huge. So I doubt I’ll be finished by its release this coming week, but I’ll hopefully make some good progress by then. You’ll definitely be hearing more about this game from me, so keep an eye out. *Update: Euclidean Lands, published by kunabi brother, just released. That’s the other game I was playing ahead of time. You can see my walkthrough for the first fifteen levels below. Keep in mind, it starts off basic, but the difficulty ramps up. It is not an easy game. And that’s it for this week! It may not sound like much, but I’ve been playing almost non-stop. If you’re looking for a new game to play, definitely grab some of these! Until next week, that’s My Week Unwrapped! Have you made it past 32 in Euclidean Lands? I can’t seem to find my way past this one, you’re the only person who seems to have published anything covering more then just a couple of levels.